Birla Mandir : The Birla Temple, built by BD Birla is the major tourist attraction in the Jaipur city. Also known as Laxmi Narayan Temple, this temple is located on an elevated ground at the base of Moti Dungari hill. This temple is one of the major attractions of Jaipur and looks stunning, when it is brightly lit in the night. Three huge domes of the temple represent three different approaches to the religion and the beautiful white marble temple mesmerizes the onlookers, when it glows at night. Jantar Mantar : The Jantar Mantar is a collection of architectural astronomical instruments, built by Maharaja Jai Singh II between 1727 and 1734. Early restoration work on the same was undertaken under the supervision of Major Arthur Garrett, a keen amateur astronomer. The name is derived from jantar, instrument, and Mantar, formula, therefore jantar mantar means literally 'calculation instrument'. 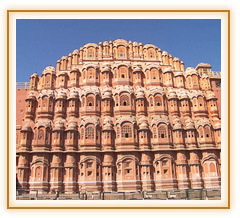 Hawa Mahal : Hawa Mahal, also known as Palace of the Breeze was built in 1799 by Maharaja Sawai Pratap Singh, and designed by Lal Chand Ustad in the form of the crown of Krishna. Its unique five-storey exterior is also akin to the honeycomb of the beehive with its 953 small windows called jharokhas. The original intention of the lattice was to allow royal ladies to observe everyday life in the street below without being seen. 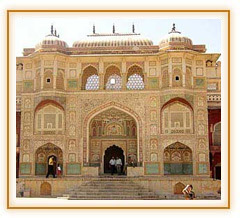 Albert Hall : Albert Hall Museum is the oldest museum of the State of Rajasthan. The building was designed by Sir Samuel Swinton Jacob and was opened as public museum in 1887. It has rich collection of paintings, carpets, ivory, stone, metal sculptures, colorful crystal works, etc. Situated in Ram Niwas Garden outside the city wall, Albert Hall Museum is a fine example of Indo-Saracenic architecture. City Palace : Including the Chandra and Mubarak Mahal palaces and other buildings, City Palace was the seat of the Maharaja of Jaipur, the head of the Kachwaha Rajput clan. The Chandra Mahal palace now houses a museum but the most part of it is still a royal residence. The palace complex is located northeast of the grid patterned Jaipur city and incorporates an impressive array of courtyards, gardens and buildings. The palace was built between 1729 and 1732, by Sawai Jai Singh II, the ruler of Amber. King planned the outer walls, and later additions were made by successive ruler up to the 20th century. Jal Mahal : Jal Mahal, also known as Water Palace is located in the middle of the Man Sagar Lake in Jaipur city. The palace and the lake around it were renovated by Maharaja Jai Singh II of Amber. Recently, it has got an eye-popping makeover. Traditional boat-makers have crafted the Rajput style wooden boats and a gentle splashing of oars on the clear lake waters takes visitors to Jal Mahal. Shopping the small scale cottage ind Arr. 4.30 Pm Dep. 5.30 pm.